Steve and I had a fun and productive trip to E3 this June. 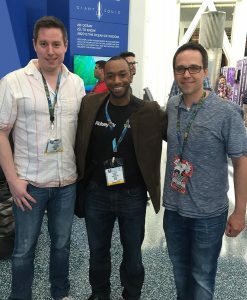 We met up with several developers, publishers, friends, and former studio colleagues. We also tried VR for the first time and looked really silly waving our arms around in the air with dumb grins on our faces. Here’s a great shot of the Anew: The Distant Light dev team. From left to right – Steve Copeland, composer Will Roget, and me (Jeff Spoonhower). 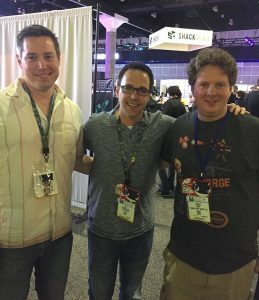 We also walked the show floor and hung out with our good friend, former colleague, grad school classmate, and creator of the indie hit Axiom Verge – Tom Happ!